If you follow my Instagram or Facebook you already know that this weeks nails have been dedicated to a very special cause. September is Polycycstic Ovary Syndrome Awareness Month and represented by teal and white. "Polycystic ovary syndrome (PCOS) is the most common female endocrine disorder, affecting approximately 5%-10% of all females. PCOS is a hormonal disorder that involves multiple organ systems within the body, and is believed to be fundamentally caused by insensitivity to the hormone insulin. It can be diagnosed in all phases of life - in girls as young as 8-9 years of age, up through post-menopause. Although PCOS is one of the leading causes of infertility, the reproductive aspects of the disorder are secondary. PCOS is not limited to women of reproductive age or potential." 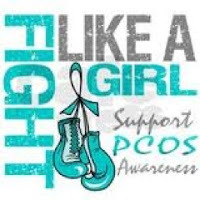 For more information on PCOS vist PCOS. September is also Ovarian Cancer Awareness Month. For more information on Ovarian Cancer visit here: OC Have a great weekend!